The battlefield spread before me is littered with tanks with armour plating, tanks armed with rail guns, and tanks hiding behind invisibility cloaks (I can’t see them but the laser beams scorching infantry are a dead give away). The map’s buildings are being blown into concrete rubble by SCUD missiles and artillery. And a silo has opened up in the enemy base to reveal a stonking great nuke. Act of Aggression isn’t Command and Conquer Generals 2. But it’s close enough. 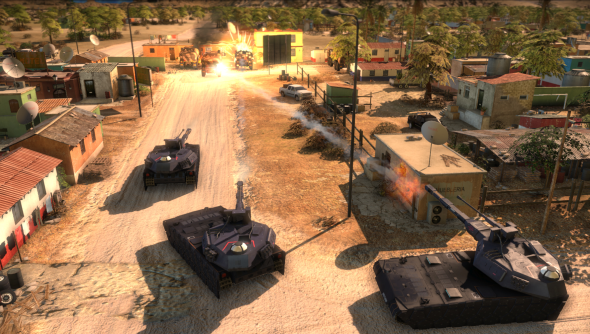 Act of Aggression’s an RTS that smells of Westwood. Eugen say they’re not trying for C&C’s cheesy style, instead something more realistic, closer to the real world setting of their other games, Wargame: Airland Battle and Red Dragon. But that’s not stopped them from keeping Aggression’s micromanagement simple, filling it with gratuitous explosions, and packing their armies with prototype weapons. Set in 2025, a shadowy organisation called The Cartel’s started to take power from the US and UN, using prototype weapons stolen from the armies’ own defense labs. These three factions are all playable in skirmishes and multiplayer, though the main campaign follows the US’s efforts to rout The Cartel. Each faction’s found its niche: the US specialise in powerful (but pricey) hardware. The crown of their army is the M1 Abrams, which can be upgraded with extra armour plating and a missile battery. 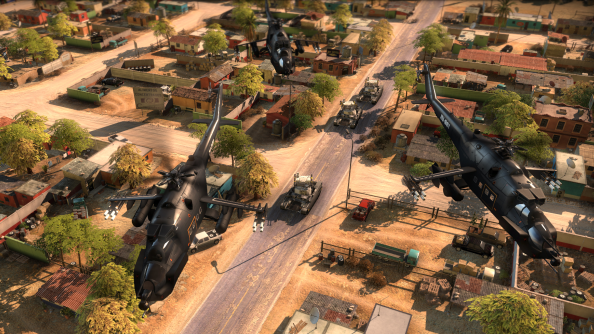 The Cartel bring that stolen tech to field, attacking with drones and invisible tanks. The UN military cabal, Chimera, make do with manpower, overwhelming their enemies with cheaper units. Aggression uses the same engine as Wargame: Airland Battle making it a gorgeous thing to look at. 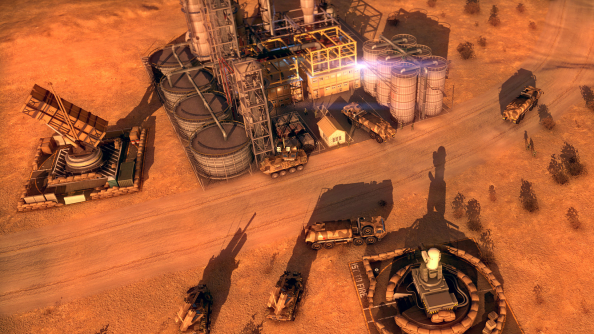 Eugen founder Alexis Le Dressay showed off a sweeping desert landscape with clusters of buildings before spawning in some pleasingly beefy tanks and blasting the structures into chunks of concrete. Roads crisscross the map, carving through the cities and leading your eye to points of interest – like resources and salvage crates. The AI’s pathfinding favours roads, where units receive a small speed boost, it also lets the designers use crossroads as a sort-of open air choke point. You’ll need to build roadblocks of pill boxes and garrisoned buildings here to block the enemies’ AI. Most maps start with you slapping down some resource refineries, a barracks, and a tank factory before churning out an army which you send to blast your enemies’ base to dust. Eugen are focussing on speed and simplicity – resource harvesters and construction units take care of themselves. They want you commanding legions of ground and air vehicles in battle, not managing a build queue back at base. While Eugen have stripped out unnecessary mouse clicks they’ve given us a myriad of specialising choices. Take the US’ APCs: they can be fitted with a gatling gun, TOW missile launcher, or anti-air weapons but the upgrades mean it can carry fewer troops. You can power your base with a power plant or solar panels. The power plant produces much more energy but it’s liable to explode under fire and take a chunk of your base with it. The upgrades feed into the classic rock-paper-scissors formula. Facing infantry, then an APC with a gatling gun will turn them into mincemeat. If an invisible tank is burning up your front line then you should call in a scout chopper to reveal it from above. Towards the end game, when you’ve upgraded your base’s research buildings, you’ll gain access to super weapons. Le Dressay showed me a nuke silo housing a giant missile wreathed in smoke and steam. The missile can target anywhere on the map and it will be wipe out everything in its blast radius. All this high tech gear looks to leave infantry in a rather tricky place: they’re slower, weaker, and less well-armed than the myriad of vehicles rushing around the map. They’re not entirely useless, however. Infantry can take prisoners. Whenever a vehicle’s destroyed there’s a chance the operator will survive, injured on the battlefield. If you can get an enemy pilot back to your base you receive a trickle of cash for as long as you hold them. By the end game you can have a very healthy income from prisoners alone. This becomes vital once the map’s aluminum mines and oil wells run dry. Act of Aggression isn’t Command and Conquer Generals 2, Eugen want to give us finer control over the construction of our armies, they’re aiming for a more grounded real-world setting, and there’s no hint of live action cutscenes starring wrestlers. But what they showed me scratched an itch I’ve had since the original Generals was released back in 2003. It’s fast-paced, bombastic, and it’s coming out in May. Editor’s note: Accommodation and travel were paid for by Focus Home Interactive.